The University of Texas-Pan American invites the public to ring in the holiday season with the pageantry and beauty of the Mariachi tradition. The University's Department of Music presents the award-winning UTPA Mariachi Aztlán in Mariachi Christmas Concerts, Sunday, Dec. 18 at 2 p.m. and 5 p.m. in the UTPA Fine Arts Auditorium. The concerts will also feature performances by the Luz de Luna Folkloric Dance Ensemble and McAllen High School's Mariachi Oro. Come and enjoy the beauty and exuberance of Mexican folk music as the Mariachi Aztlán celebrates the festive customs associated with a Mexican Christmas celebration. Since 1989, the UTPA Mariachi Aztlán has traveled throughout the United States, Mexico, and Canada as ambassadors representing the beauty of Hispanic music and cultural traditions, and creating a bridge of cultural understanding between the two countries. This year, the Mariachi Aztlán won first place for the second consecutive year at the Mariachi Spectacular de Albuquerque and were invited to perform at the Hollywood Bowl, selected from professionals groups across the nation. Last year, the group also performed for President Barack Obama in Washington, D.C., and with the Houston Grand Opera in the premiere of the world's first Mariachi opera. 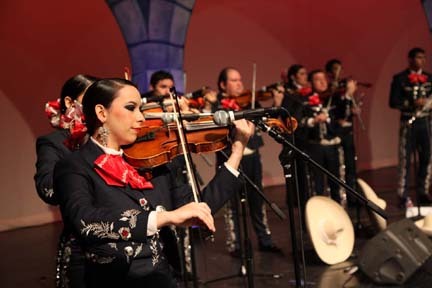 The UTPA Mariachi program was founded by Dr. Dahlia Guerra, dean of UT Pan American's College of Arts and Humanities, and is directed by Francisco Loera, a faculty member of UTPA's Department of Modern Languages and Literature. Tickets for either concert are $5 at the door. If special assistance or accommodations are necessary please call Voice TDD (956) 665-3471 three days in advance. For more information, call (956) 665-3471.